A Viking Raiders workshop for Key Stage 2 pupils will be offered alongside a new Valhalla exhibition at Shrewsbury Art Gallery from February. The exhibition, named Valhalla – Life and Death in Viking Britain, will feature human skeletons and artefacts found at recently discovered Viking burial sites, key findings from archaeologists and the latest pathological research. The purpose of the showcase is to shed new light on the lives and deaths of Viking ancestors. To complement the exhibition, schools will have the chance to try their hand at a range of interactive sessions and group discussions. Plus, object handling and role-play will all be part of the experience. 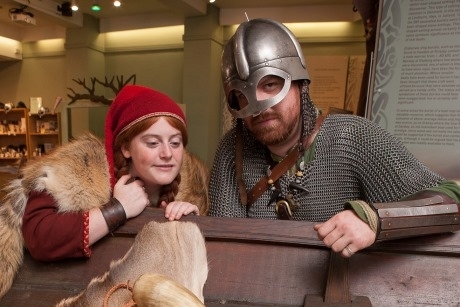 During their visit children will be led through a range of imaginary scenarios inspired by real life events, focusing particularly on the raiding activities of the Vikings in the region and traditional Viking sagas. The workshops will be split into five different sections so that pupils will engage with different aspects of Viking life in creative ways. • Life in the 9th century Shropshire, where an investigation of archaeological evidence of Viking Britain will take place. • The raid, which is a costumed role-play session introducing pupils to the arrival of the Vikings in the royal court of the Saxon King. Learners can debate the King’s options – whether he should fight back, run away or agree terms. • Viking sagas, which allows pupils to explore Viking customs and costumes and role-play the story of god Thor and his stolen hammer. • The final section will be a quiz themed around the exhibition and will help pupils look for archaeological evidence of Viking domestic life, burial rites, trades and battle techniques. All day museum entry and the use of a lunch room is included within the workshop price and the exhibition will run from 8th February until the 4th June. For more information visit www.shrewsburymuseum.org.uk or email museumeducation@shropshire.gov.uk to book onto the workshop.